The first car stops at the stops sign line and then pulls up to the edge of the road at an intersection. The second car stops at the stop sign line behind the first car. When the traffic is clear is it legal for both cars to depart at the same time? The second car must keep a safe distance at all times. As long as the cars are both standing still, "safe distance" is a very short distance. If both cars started moving simultaneously and accelerated at the same rate, by the time they reach 10mph that distance will not be safe anymore. So the second car could technically leave at the exact same time, but would have to accelerate at a much lower rate to keep a safe distance at all times. When the traffic is clear is it legal for both cars to depart at the same time legally? Jurisdiction could be relevant because it is conceivable that some countries might have a law or convention in place that determines who has the right of way in that scenario. Absent any such rule, a driver's entitlement to depart at the same time as others is superseded by the criterion of whether doing so is "careful and prudent" under the conditions of that moment and/or place. For instance, traffic might be clear, but departing at the same time might be a risky or bad idea if roads are icy. Except when directed to proceed by a law enforcement officer, every driver of a vehicle or trackless trolley approaching a stop sign shall stop at a clearly marked stop line, but if none, before entering the crosswalk on the near side of the intersection, or, if none, then at the point nearest the intersecting roadway where the driver has a view of approaching traffic on the intersecting roadway before entering it. After having stopped, the driver shall yield the right-of-way to any vehicle in the intersection or approaching on another roadway so closely as to constitute an immediate hazard during the time the driver is moving across or within the intersection or junction of roadways. The first sentence says you must stop at the line. The second line says you have to yield the right-of-way to vehicles in the intersection after stopping. Therefore I believe it is legal to follow the leading car immediately as long as you don't run into them. However, I would not follow them immediately if it were a 4-way stop. I think it would be too confusing for the other drivers. CAUTION: You might still get a ticket even if it's technically legal. A police officer might not notice where the stop line is. I advise you to use a dash cam for protection. So there is a situation on a road I frequent where there is a stop sign intersection that crosses an almost immediate stop light on the other side of the straight. 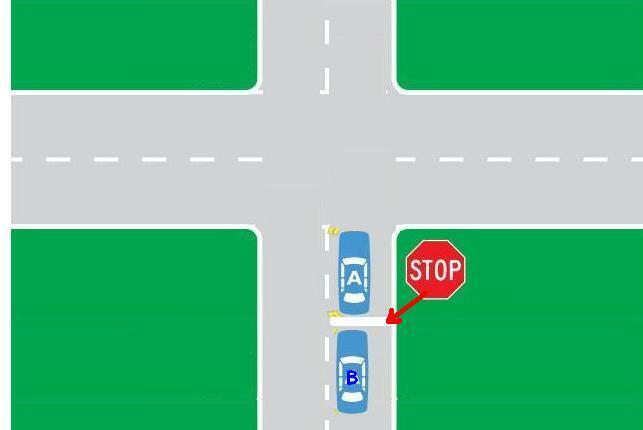 In this jurisdiction, right on Red when traffic is cleared is legal, so normally, Car A will pull forward of the stop sign and wait for right hand turn, while car B will remain at the stop sign if until A makes the right turn or wait for the light to become green to make a left or straight. You must stop at the stop sign - stopping behind a car that is stopped at the sign is not stopping at the stop sign. Not the answer you're looking for? Browse other questions tagged united-states united-kingdom traffic regulations or ask your own question. Can you be given a too-close-to-stop-sign citation if area was unmarked? In Victoria are the police allowed to speed to pull over a car that is not attempting to escape from them? Is it legal for police to use their lights to go through a red light? Who has right of way at an intersection with two stop signs across from each other? Is the area in front of shops considered a pedestrian zone / crosswalk? Does a freight train need to obey a stop sign? Neighbor blocks our narrow road with his cars specially when parking, can we file a criminal case against them?